Mobile printing capability Features Wi-Fi Direct and local Wi-Fi connectivity to enable mobile printing via HP ePrint, Apple AirPrint™ as well as other solutions. Supports printing from most smartphones and tablets using these operating systems: Android, iOS, Blackberry, Windows® 8, Windows RT. Wireless performance is dependent upon physical environment and distance from the access point. Wireless operations are compatible with 2.4 GHz routers only; excludes wireless direct. Wireless direct may require driver or apps be installed and connected on wireless-enabled mobile device or PC. Wireless functionality may vary by computer and mobile operating systems, see hpconnected.com. HP ePrint requires: account registration, HP ePrint-enabled printer, Internet connection, and a wireless-enabled mobile device or Internet-connected computer with email capability. Separately purchased data plans or usage fees may apply. Print times and connection speeds may vary. 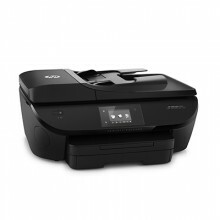 AirPrint supports OS X® Lion, OS X® Mountain Lion and the following devices running iOS 4.2 or later: iPad®, iPhone® (3GS or later), iPod touch® (3rd generation or later) and requires the printer be connected to the same network as your OS X or iOS device. AirPrint, the AirPrint Logo, iPad, iPhone, and iPod touch are trademarks of Apple® Inc. Windows® is a trademark of the Microsoft group of companies. BlackBerry® names and logos are the property of Research In Motion Limited. Android is a trademark of Google Inc. Minimum system requirements Windows 7, 8, 8.1: 1 GHz 32-bit (x86) or 64-bit (x64) processor, 2 GB available hard disk space, CD-ROM/DVD drive or Internet connection, USB port, Internet Explorer. Windows Vista: 800 MHz 32-bit (x86) or 64-bit (x64) processor, 2 GB available hard disk space, CD-ROM/DVD drive or Internet connection, USB port, Internet Explorer. Windows XP SP3 or higher (32-bit only): any Intel® Pentium® II, Celeron® or 233 MHz compatible processor, 850 MB available hard disk space, CD-ROM/DVD drive or Internet connection, USB port, Internet Explorer 6.